Home Latest News Jawazat Related News Has the visit visa fee for Pakistanis reduced to SR 338? 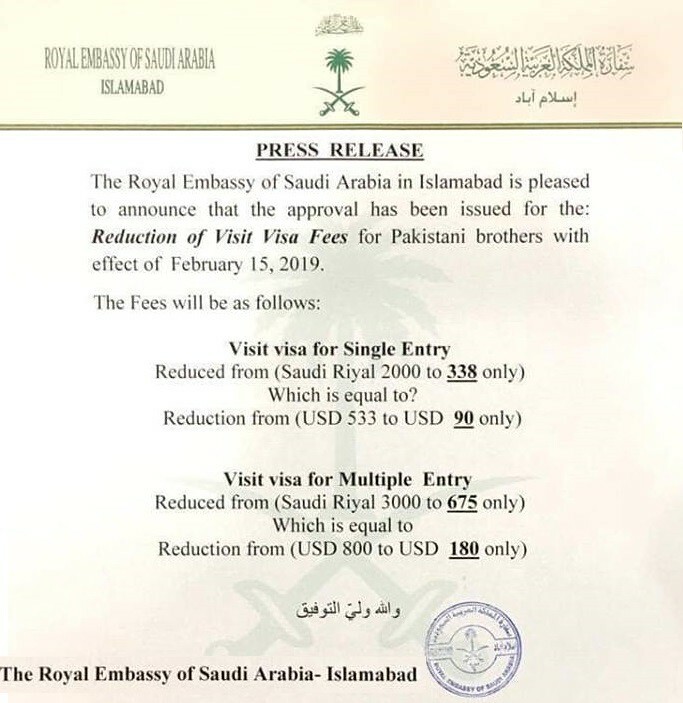 A message along with an image has been in circulation in the social media these days which claims that the fee for the Saudi visit visa for Pakistanis has been reduced to SR 338. As a result, Etimad visit visa fees for Pakistan in 2019 has also been reduced. We have given its detail at the end of the article. The decision will be implemented starting from Friday, corresponding to the 15th of Feb 2019. Source: This is just a WhatsApp message and it is written on the message itself that it is an unofficial translation. However, it can be guessed from the language used in the letter that it does not seem to be fake. 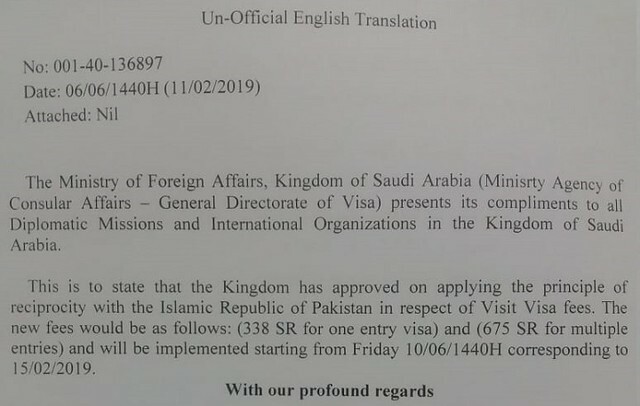 In addition to the above WhatsApp message, the Embassy of Pakistan in Riyadh has also posted on its official Facebook page that the Saudi visit visa fee for Pakistanis has been reduced. This is the message they have posted. VISIT VISA FEE: Saudi government has decided to reduce the Saudi visit visa fee for Pakistani citizens. Refer to the website of visa services for more details. A press release has also been issued by the Saudi Embassy in Islamabad which reads as follows. Visit Visa for Single Entry: Reduced from SR 2,000 to SR 338 only which is equivalent to USD 90. Visit Visa for Multiple Entry: Reduced from SR 3,000 to SR 675 only which is equivalent to USD 180. As a result, Etimad visit visa fees for Pakistan in 2019 has also been reduced. Etimad has also updated the new Saudi visit visa fee for Pakistanis on their website according to which the fee for the single entry visit visa is SR 338 and the fee for the multiple entries visit visa for 2 years is only 675. If you want to apply for a visit visa, you must be wondering about the Etimad Visit Visa fee for Pakistanis in 2019. Has the Saudi visit visa fee for Pakistanis reduced to SR 338? After considering all the information stated above, we can conclude that finally there is some good news for Pakistani nationals living in Saudi Arabia. They would be paying only SR 338 to process single entry visit visa and SR 675 to process a multiple entry visit visa for 2 years.